I digress. Whatever your feelings about mornings, we all have to wake up at some point. And we make a lot of choices immediately afterwards. We choose what to wear, what to eat for breakfast, what to pack for lunch, etc. In my house, we're also working at choosing our attitude for the day. As a teen and young adult, one thing I remember hearing from my mom was to always dress nicely, especially when you don't feel well. You can trick yourself into feeling better if you choose to look better. There's actually lots of research into the science of happiness and it tells us that we really can "fake it til we make it." Besides dressing nicely, another good way to trick your brain into happiness is with some positive thoughts first thing in the morning. Some people use prayer or meditation in this way. We also use the bathroom mirror! I initially bought it so the kids could see their faces better when washing up or brushing teeth. It's actually the only full length mirror in the house, but we still don't use the top half that often. 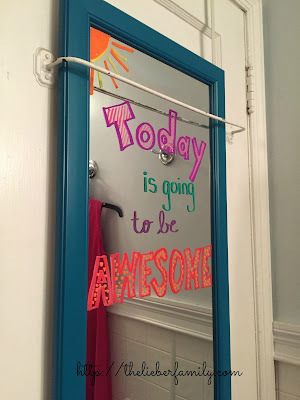 Instead of thinking of it as wasted space, I turned it into our positive thought for the day. I was recently offered some liquid chalk markers to test out and they were perfect for updating my morning message! 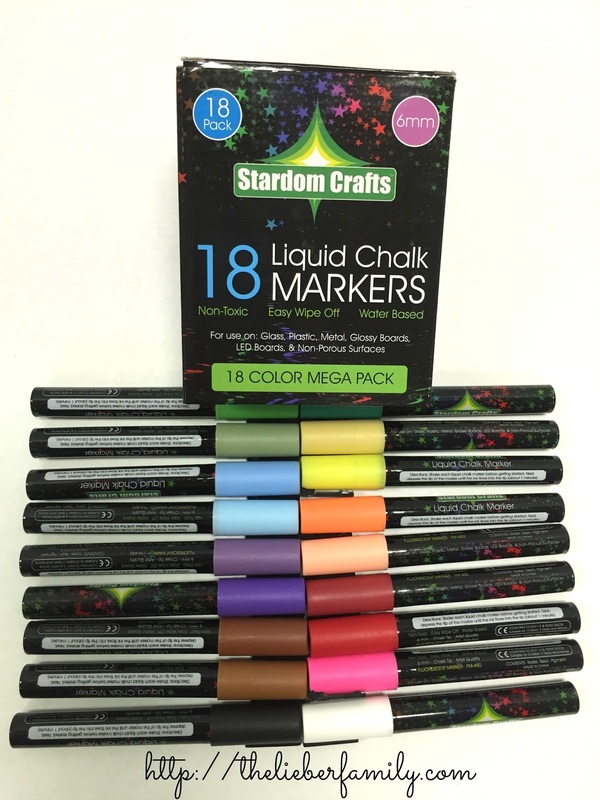 Stardom Craft's Liquid Chalk Markers come in a box of 18 assorted colors. 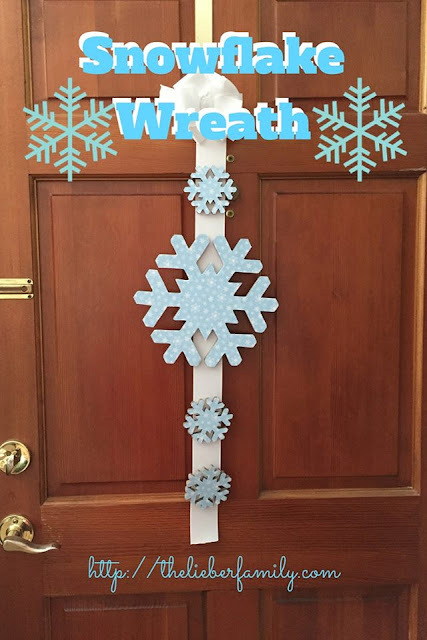 They are perfect for writing on most non-porous surfaces: windows, mirrors, white board, metal, etc. They don't drip and they clean up easily (which I know for sure because it took me three tries to write the word "awesome"). They are non-toxic and safe for kids older than three to use. 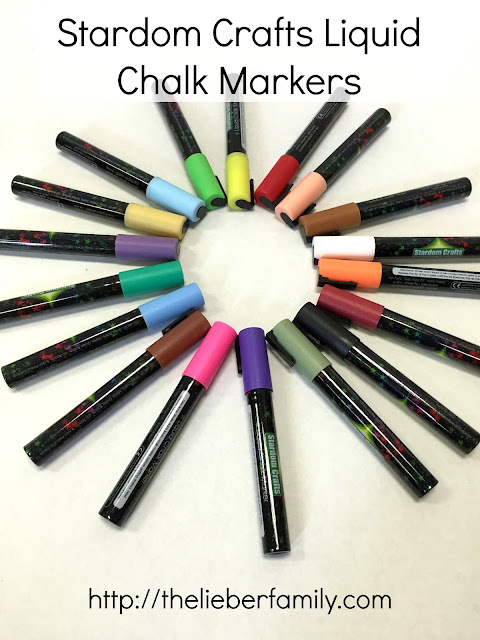 These markers have a chisel tip which is great for making thick, broad strokes as well as thin, detailed lines. I try to update this mirror message at least once a month to keep it fresh and not let it become monotonous or something they ignore. I've used bible verses, seasonal song lyrics, or other quotes. My goal is to put positive thoughts into their heads as early as possible in the morning to remind them to choose a good attitude for the day. The bright colors and happy stripes and polka dots help too. Stardom Crafts Liquid Chalk Markers are available for purchase on Amazon. You can also find them at StardomCrafts.com. Those are too cute! I keep meaning to buy something like that but then I worry that the kids would ruin them... There's no safe hiding space around here! How cool! I have some budding artists that would seriously love to create some awesome masterpieces with them!